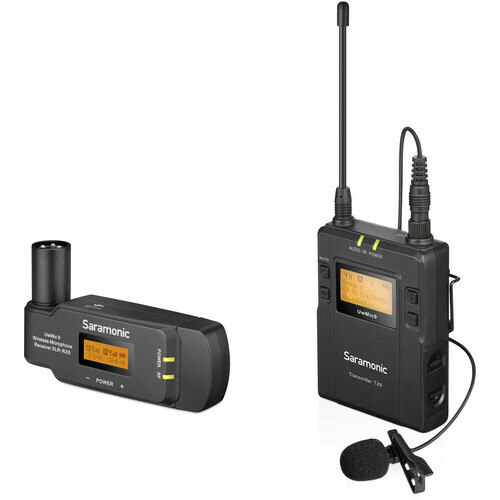 Step your next video project up to broadcast-quality audio with the Saramonic UwMic9 UHF Wireless Lavalier Mic System with Plug-On Receiver, a portable wireless system ready to capture audio from a single subject, and for easy expansion by adding a second transmitter and microphone. It includes one dual-channel receiver, one bodypack transmitter with an omnidirectional lavalier microphone, and a bundle of cables and accessories. With a maximum operating range of 330 feet, it can be effectively used in an array of environments for video, field recording, interview, broadcast TV, and ENG applications. The system's RX-XLR9 plug-on receiver features an easy-to-read LCD screen, rotatable positioning, and a wide-switching RF bandwidth with 96 channels. It boasts infrared synchronization with the transmitter, an auto-scan function, and two audio outputs—a balanced 3-pin XLR, and a 3.5mm jack for real-time monitoring with headphones. Connect it directly to your mixer's XLR input, or use the supplied shoe mount to attach it to your camera. The compact transmitter employs a crystal-controlled PLL synthesizer and a convenient muting function. The RF power output can be switched between high, middle, and low settings to accommodate a range of shooting distances and session durations. The 3.5mm input can accept mic- or line-level signal, making it compatible with sources such as microphones and mixers. Add the capability of wireless audio reception to your camera, mixer, or audio recorder with the Saramonic RX-XLR9, an XLR-equipped, dual-channel wireless plug-on receiver designed for UwMic9 systems. Connect it directly to your device's XLR input, or use the included XLR to 3.5mm cable and shoe mount to integrate it into your camera-based setup. Since the receiver rotates up to 320 degrees, it can easily be positioned to make room for other gear. The RX-XLR9 works with one or two compatible transmitters (available separately) at a maximum operating range of 330 feet. With automatic scanning and 96 selectable channels in two groups across the 514 to 596 MHz UHF spectrum, the RX-XLR9 ensures reliable wireless signal reception for your interviews, film/TV projects, ENG, EFP, and more. A backlit LCD screen ensures clear viewing of vital information such as the battery status, group, and channel. In addition to the balanced 3-pin XLR output, the RX-XLR9 features a 3.5mm TRS headphone jack for convenient signal monitoring. Power the receiver via two AA batteries or an external USB battery pack (available separately).